I Wouldn't do that. I think you would have too much flex. I think you could, in place, cut the slots to to the control holes using a dremel and also a hacksaw blade. Last year ago I crossed Australia from west to east and back in the RV-12, covering nearly 4,000 miles over a few weeks. The airstrips in our remote outback areas are typically few and far between, so there are often limited options if the weather at a planned destination closes in. Consequently fuel capacity is a significant issue for long-distance flying in much of this country, and the RV-12’s standard 75 litre (19.8 gal) tank is a bit too marginal for comfort at times. On the trip I carried an additional 20 litres (5.3 gal) in a rubber fuel bladder, but had to land somewhere to top up the tank. While this was manageable it was hardly convenient, and having fuel on board that you can’t use when you need it is pretty useless. 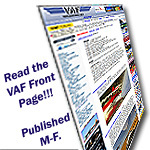 Others have previously posted workable solutions for carrying additional fuel in the RV-12. 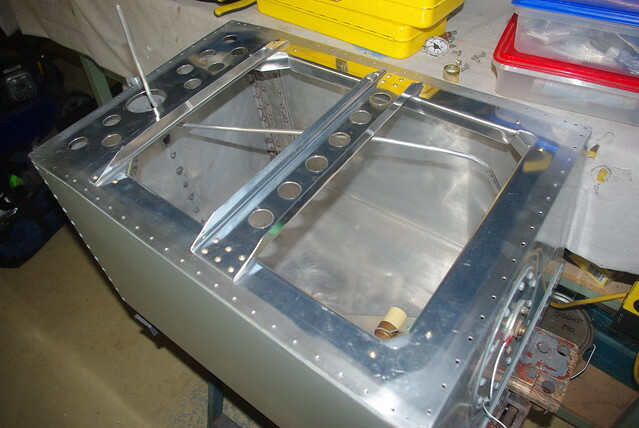 A marine tank in the baggage compartment plumbed into the main tank with a pump and flexible lines to transfer the fuel, or a fuel bladder on top of the tank with gravity feed into the main tank are two options. Neither of these appealed to me much, mainly for safety reasons related to securing the extra tank adequately and the risk of leaks or fumes when transferring fuel around the cabin. In the end, I decided to increase the capacity of the existing tank from 19.8 gal to 25 gal (95 litres) by simply making it taller. 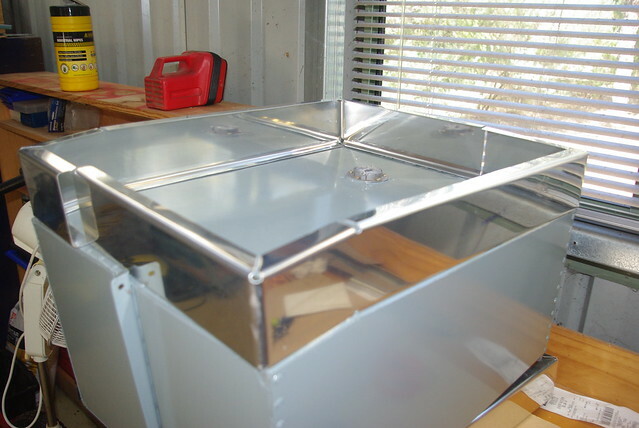 In principle, it’s easy – make a skirt to raise the sides of the tank, take off the tank lid and use it as a template to make a stiff internal brace to go between the top of the original tank and the skirt, put the lid back on, install a new Moeller gauge, and shorten the filler neck and vent line. In practice, it’s quite a lot of work but a fun job if you don’t mind doing a bit of home fabrication. It would be great if Vans offered a taller tank option, but I can well understand why that’s unlikely to happen any time soon. This is not a trivial modification and there are some issues to think about, the obvious ones being the increased load on the three tank attachment points, a slight aft shift in the c.g. 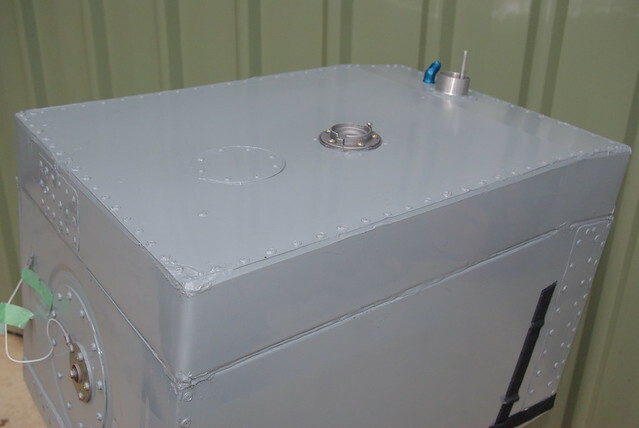 due to the increased tank empty weight, and a significant reduction in baggage capacity with a full fuel load. On the other hand the big advantage is that all the extra fuel is in the tank where you want it – no plumbing, pumps or extra tanks required, and it effectively takes up no additional space. Why 25 gal and not 30 gal when all that would take is a slightly taller skirt? I was fairly comfortable with 25 gal, but not with 30 gal because of the additional load on the attachment points and c.g. issues. I did enough calculations to satisfy myself that the increased stresses were reasonable using the existing fittings, but if you decide to attempt this, make your own assessment. I also replaced some aft bulkhead attach angle rivets with Cherrymax rivets. For local flying there’s usually no need to fill the tank with more than 20 gals anyway, but it’s nice to have the extra capacity available for longer trips. That extra 70 or so minutes of flying time could be important one day. Last edited by rgmwa : 06-17-2017 at 02:38 PM. 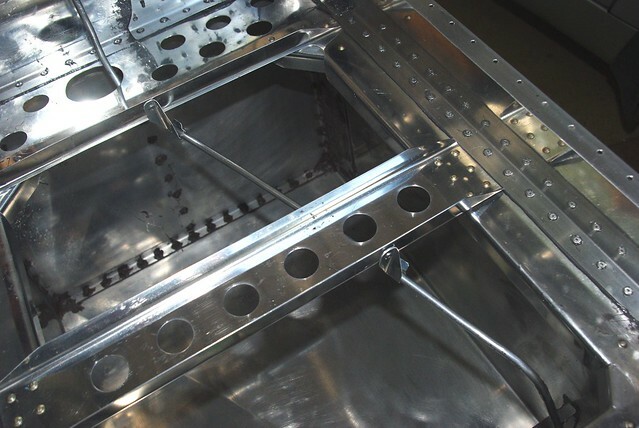 Question, I received the Vans predrilled two piece baggage compartment closeout upgrade. Any reason not to take off the blue protective vinyl if it will be covered? Other than a few places to attach Velcro? Rational, protection or is it a flammable material and must come off....I'm not the builder. Remove it -- corrosion is known to occur under the plastic wrap over time. Definitely remove the blue vinyl. 1) I have to drill some of the nutplate and screw holes. Is there a recommended process to follow...as in; do the first and last, cleco them then match drill those in between? Sorry, sounds dumb I know. 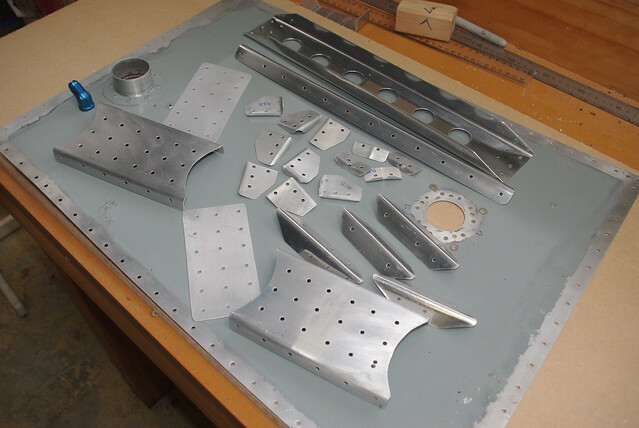 I would bet you could find someone in your local EAA chapter who would be happy to squeeze a few rivets for you, or loan you a rivet squeezer. Thank you! And no doubt there is. I bought my RV-12 E-LSA from the original builder two years ago with 48TT. The elevator trim servo seemed weak from the get-go. My point of reference was flying a J3-Cub for 23 years so a correctly operating electrical trim was not my forte. Long story short… The trim quit working about two months ago and an exhaustive diagnosis didn’t find the problem. The trim began working again and allowed flying until last week when it quit once again. The definitive diagnostic test was to apply voltage from a 9-volt battery to pins 31 & 32 on the 37-pin tunnel M harness D-Sub connector. These pins are the two motor leads for the elevator trim servo. Servo motor ran very strong on 9VDC so servo is good and wiring from pin connector to servo is also good. Problem can only be in the main control circuit board on the instrument panel that houses all the rocker switches and fuses. I suspect bad PWM (pulse width modulator) that directly controls the servo motor speed. Trim pot adjustment for speed didn’t do anything. I have probably spent a total of two weeks troubleshooting this system and finally decided enough is enough. And so I made a management decision to make my own hard-wired servo control circuit using Ray Allen parts. I have been planning for this day. I basically removed the existing trim up/down rocker switch and in its place I installed a Ray Allen RS2 rocker switch, Ray Allen SPD-1 servo speed control, and a two-position toggle switch which allows either fast or slow servo speed. Wow, what a difference... The servo is now running very strong and the two discrete speeds work really well. Slow speed is used in cruise flight to allow small adjustments to prevent hunting and overshooting. Fast speed is used in the pattern to allow quick setting of trim. Works like a charm. I can pull power, drop flaps in the white arc, and trim for hands-off glide in very short order. Making this modification is not for the faint of heart. It requires cannibalizing the printed circuit board to allow installing the new rocker switch. The old rocker switch is removed by drilling a succession of small holes through the circuit board that outlines the back of the switch. See attached photo. Then cut through the holes to remove the switch. Foil tracing on the circuit board gets cut in the process but no problem - that circuit is not being reused. Install new Ray Allen rocker switch and speed selector toggle switch through front panel and mount the speed control with double-sided foam tape to the aluminum plate on the back of the control circuit board unit. Use a small rubber grommet to feed wires through the aluminum back panel. As always - use Tefzel wire. You will need to remove pins 31 & 32 from the 37-pin tunnel M harness D-Sub connector and attach to the new Ray Allen hard-wired circuit. It’s also necessary to find a new source of 12 VDC to power this circuit. There is a spare fuse location on the main fuse block. This spare is easily accessible and I soldered a wire onto the base of the fuse spade lug to power the new circuit. A new 2 amp fuse labeled ‘TRIM” now powers the new circuit. Most planes have the top of the switch labeled "DOWN", like you have it. I know it seems counter intuitive, but the way that I remember it is that pushing the top of the control stick causes the nose to go down. Last edited by Mich48041 : 09-07-2017 at 01:48 PM.